Inflammasomes are multimeric protein complexes that are crucial for host defense to infection and endogenous danger signals. They promote the secretion of the pro-inflammatory cytokines interleukin (IL)-1β and IL-18 and cause a rapid and pro-inflammatory form of cell death called pyroptosis. Inflammasomes assemble in the cytoplasm of innate immune cells, such as macrophages and dendritic cells, in response to cytosolic pathogen-associated molecular patterns (PAMPs) or danger-associated molecular patterns (DAMPs). Several inflammasomes have been identified . They generally contain an inflammasome sensor, the adaptor protein apoptosis-associated speck-like protein with a CARD (ASC) and pro-caspase-1. Typically, the inflammasome sensor is a member of the NOD-like receptor (NLR) or AIM2-like receptor (ALR) families. The most intensely studied inflammasome is the NLRP3 inflammasome. It is activated by a broad variety of stimuli, including danger signals (e.g. ATP), crystalline substances (e.g. MSU) and microbial toxins (e.g. nigericin). Once assembled, canonical inflammasomes catalyze the conversion of pro-caspase-1 into active caspase-1, which in turn proteolytically activates IL-1β and IL-18 and triggers pyroptosis. To avoid excessive inflammatory response, activation of the NLRP3 inflammasome is tightly regulated and requires a two-step process. The first step is the upregulation of NLRP3 and pro-IL-1β, which is induced by the detection of extracellular PAMPs by pattern recognition receptors (PRRs), such as LPS by Toll-like receptor (TLR) 4. The second step is the assembly of the inflammasome triggered upon detection of intracellular PAMPs/DAMPs. Additional caspases, such as caspase-11 and caspase-8, have recently been identified as indispensable upstream mediators of caspase-1 in certain settings. In mice, infection by Gram-negative bacteria is detected by the NLRP3 inflammasome through a non-canonical pathway that requires caspase-11 . Detection of extracellular LPS by TLR4 induces the expression of pro-caspase-11 in a TRIF-dependent manner. Once upregulated, pro-caspase-11 becomes activated by intracellular LPS, independently of TLR4 [3, 4]. A recent study suggests that cytosolic LPS binds directly to caspase-11 and human caspases-4 and -5 (the orthologs of murine caspase-11) . Caspase-11 triggers pyroptosis and promotes the assembly of the NLRP3 inflammasome leading to caspase-1 activation. This is unique to NLRP3; all other inflammasome sensors activate caspase-1 independently of caspase-11. Caspase-8, traditionally associated with the apoptotic pathway, has been shown to form a non-canonical inflammasome upon the detection of extracellular fungal or mycobacterial PAMPs by the PRR Dectin-1 . 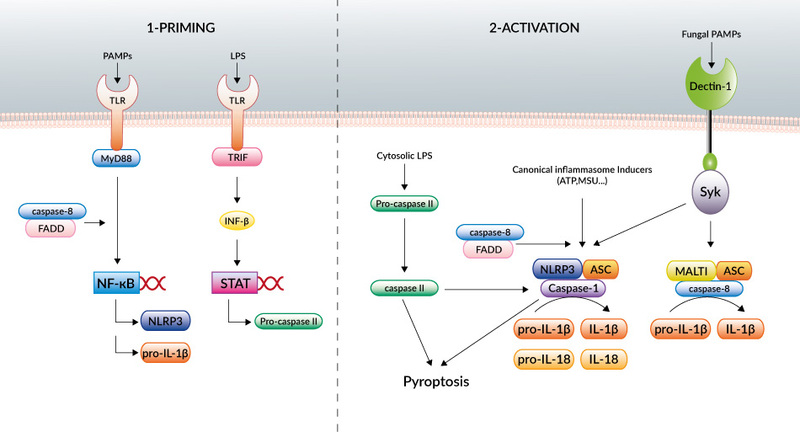 This caspase-8 inflammasome, which comprises MALT1, caspase-8 and ASC, directly processes pro-IL-1β into the bioactive cytokine, independently of caspase-1. Caspase-8 and its adaptor FADD have also been implicated in priming and activation of canonical as well as non-canonical NLRP3 inflammasomes . Several canonical and non-canonical inflammasomes can form during infection and injury. They are differentially coordinated by caspase-1, caspase-8 and/or caspase-11 in function of the type of threat. Researchers are now tasked with elucidating the complex mechanisms of inflammasome activation. This work will prove indispensable for the development of targeted therapies for inflammatory diseases. 1. Latz E. et al., 2013. Activation and regulation of the inflammasomes. Nat Rev Immunol. 13(6):397-411. 2. Kayagaki N. et al., 2011. Non-canonical inflammasome activation targets caspase-11. Nature. 479(7371):117-21. 3. Hagar JA. et al., 2013. Cytoplasmic LPS activates caspase-11: implications in TLR4-independent endotoxic shock. Science. 341(6151):1250-3. 4. Kayagaki N. et al., 2013. Noncanonical inflammasome activation by intracellular LPS independent of TLR4. Science. 341(6151):1246-9. 5. Shi J. et al., 2014. Inflammatory caspases are innate immune receptors for intracellular LPS. Nature. 514(7521):187-92. 6. Gringhuis SI. et al., 2012. Dectin-1 is an extracellular pathogen sensor for the induction and processing of IL-1β via a noncanonical caspase-8 inflammasome. Nat Immunol. 13(3):246-54. 7. Gurung P. et al., 2014. FADD and caspase-8 mediate priming and activation of the canonical and noncanonical Nlrp3 inflammasomes. J Immunol. 192(4):1835-46.